Weathering steel is a high strength, structural steel that, in suitable environments, develops a tightly adherent oxide layer or patina’, which significantly reduces the corrosion rate compared with conventional structural steel. Weathering steel has been used since the 1930’s in railway coal wagons, bridges, buildings, facades and many architectural features such as sculptures and landscaping. It has been used extensively in North America, Europe and Japan or over 55 years; and over the last 10 years in New Zealand. When designed and detailed correctly, taking into account the environmental factors that governs its use, it has exhibited excellent performance. A well designed and correctly detailed weathering steel bridge, in an appropriate environment, can provide an attractive, very low maintenance, economic solution and extends the scope for cost-effective steel bridges. 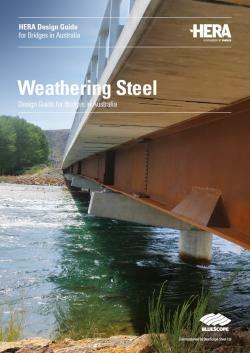 Accordingly, the Heavy Engineering and Research Association of NZ and Opus International Consultants NZ (now WSP Opus), have prepared this document entitled ‘Weathering Steel Design Guide for Bridges in Australia’. The purpose of this publication is to provide a collation of the necessary guidance for the Australian industry to assist with the efficient and appropriate application of weathering steels in Australian bridges. It also provides guidance to achieve the expected performance of weathering steel in Australian bridges, to realise the planned life span of the bridges. This publication covers the designing, construction, inspection, maintenance and even rehabilitation of weathering steel, should corrosion rates exceed those anticipated at the design stage, as well as discussing the limitations on the use of weathering steel. Comments and queries on the guide should be referred to HERA. Operating since 1987, STELTECH® is New Zealand’s leading producer of three-plate welded beams for a wide range of construction and industrial applications. We can work with your engineer to develop preliminary designs, provide complete designs that include connectors and a producer statement, or simply have a friendly chat to offer advice. Our free specification, dimensional tolerance and design tables plus our proprietary design software, MemDes, are available to assist with your design process.